No more boxed cakes or stale cookies. Let us cater your next event, and make the dessert course worth it! 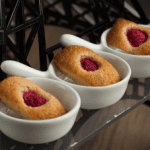 Fresh ingredients with a French twist are sure to impress your guests! 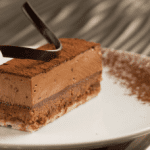 Almond dacquoise cake, hazelnut crunchy layer and delicate chocolate mousse topped with cocoa powder. S, min. order of 56 pieces $.99 ea. M, min. order of 24 pieces $1.99 ea. Brown butter cake with fresh raspberries. 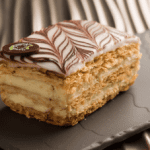 Flaky layers of buttery puff pastry with light pastry cream and fondant. Joconde cakes layered with coffee buttercream and chocolate ganache, topped with chocolate glaze. Need Your Cake Cut? No Problem! Cake cutting is free for smaller cakes and a $9 charge for larger cakes that serve 30-40. Sweet crust, almondvanilla filling, and caramelized apples. Sweet crust, almond cream, red fruit jam and strawberries. Sweet crust, almond cream, red fruit jam and berries. 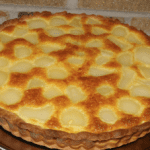 Sweet crust, almond cream and pears. Sweet crust, almond cream, red fruit jam and raspberries. 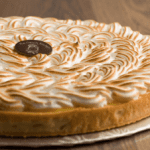 Sweet crust, lemon filling, lemon curd and meringue. Blueberry, 36 Pieces $2.99 ea. 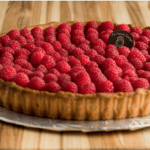 Raspberry, 36 Pieces $2.99 ea. Strawberry, 36 Pieces $2.99 ea. Mixed Berry, 36 Pieces $2.99 ea. Lemon, 36 Pieces $3.99 ea. Tart variety. Choice of strawberry, raspberry, blueberry, berries and / or lemon. Minimum 12 pieces of each type. GF Cake, 36 Pieces $1.99 ea. Carrot Cake, 36 Pieces $2.99 ea. Napoleon, 36 Pieces $2.99 ea. Royal, 36 Pieces $2.99 ea. Cake variety. Choice of Royal, Carrot Cake, Napoleon and / or GF Chocolate Cake. Minimum 12 pieces 0f each type. Available to order anytime in December. Orders for 12/24 must be ordered by 12/22 at 3 pm. Rolled sponge cake with coffee Buttercream and Meringue Mushrooms. 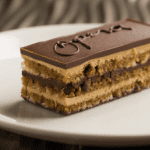 Almond Dacquoise Cake, Hazelnut Crunchy Layer and Chocolate Mousse. Sponge cake with Champagne and strawberry mousse filling, covered in chocolate glaze. 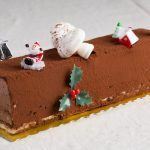 The Champagne Yule Log is only available to order for pick up 12/24 between 7 am-12 pm and must be ordered by 12/22 at 3 pm. Shortbread cake, Lemon curd, Lemon Mousse and Meringue. 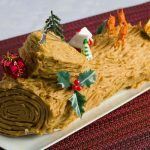 Please Note: Large seasonal yule logs that serve 15-24 people are 20 inches long. Please make sure it will fit in your freezer, or refrigerator, as we do not offer refunds.